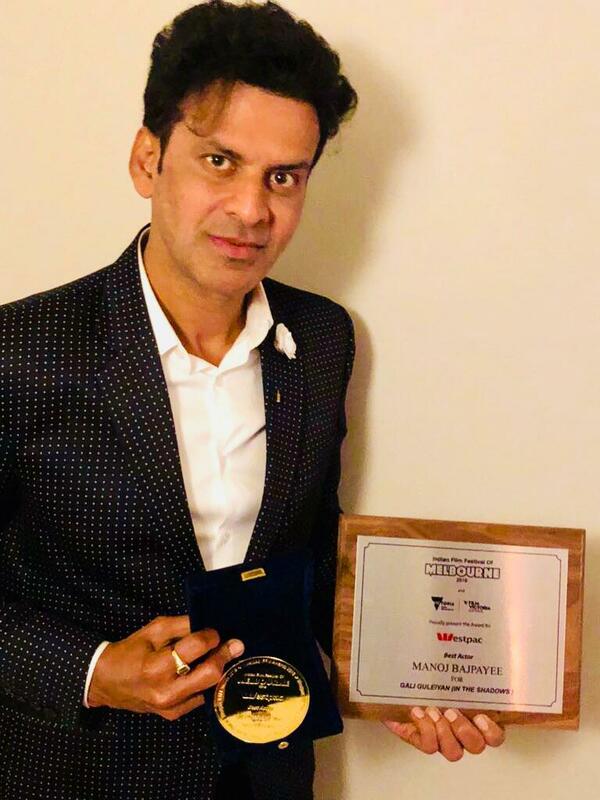 Manoj Bajpayee wins Best Actor Award and Dipesh Jain wins Best Director for Gali Guleiyan in Melbourne! Two times National Award winning actor, Manoj Bajpayee’s Hindi psychological drama, Gali Guleiyan (In the Shadows) continued its winning ways at the prestigious Indian Film Festival of Melbourne. The film won accolades in two out the four categories that it was nominated in (Best actor : Manoj Bajpayee, Best Director: Dipesh Jain, Best Supporting Actor: Ranvir Shorey, Best Indie Film). Manoj Bajpayee won the Best Actor award for his heart wrenching portrayal of a man trapped within the walls and alleys of Old Delhi and his own mind, who attempts to break free to find a human connection. The nominees in this category included- Akshay Kumar (Padman), Ranbir Kapoor (Sanju), Ranveer Singh & Shahid Kapoor (Padmavat), Varun Dhawan (October), among others. Gali Guleiyan also earned a Special Jury Mention in the Best Indie Film category. The film has had a fantastic Festival run. In fact, Gali Guleiyan has now travelled to more than 19 top International Film Festivals and won audience accolades and awards along the way. These include the prestigious Busan International Film Festival, MAMI, 42nd Cleveland International Film Festival, the Indian Film Festival of Los Angles, Atlanta Film Festival and the New York Indian Film Festival. Earlier in June’18, the film had travelled to three prestigious International Film Festivals – London Indian Film Festival (UK Premiere), where Manoj was also honored with an award, the Indian Film Festival of Stuttgart and the Munich International Film Festival (one of Europe’s biggest and most prestigious film festivals) where it had its European Premiere. In May’18, Manoj’s stellar performance had won him the Best Actor Award at the New York Indian Film Festival. Talking about last year (2017), it is not often that a film can boast of a simultaneous premiere at three prestigious International Film Festivals – Busan International Film Festival, Chicago International Film Festival & Mumbai’s MAMI and, go on to win the Grand Jury award at the latter. Yet, Gali Guleiyan did just that in 2017!! You can read a fabulous interview, from the London Indian Film Festival, with director Dipesh Jain as he gives an inside look into the creation of the film and working with Manoj here.